Through a joint effort with the National Elementary and Secondary School Sports Education Steering Committee and the China Education Development Foundation, Nike (NYSE: NKE) announced the results for Nike’s Active Schools Innovation Award yesterday evening at the Water Cube National Swimming Center in Beijing. After evaluating over 1,000 cases, the panel of judges decided on the final award winners: 28 teachers were recognized for Innovation in Culture of Sport; 25 teachers were awarded for Innovation in PE Lessons; and 47 teachers won awards for Innovation in Extracurricular PE Activity. Of these winners, 30 teachers will be given an opportunity from the Nike Community Impact department to visit the U.S. for exchange and training. 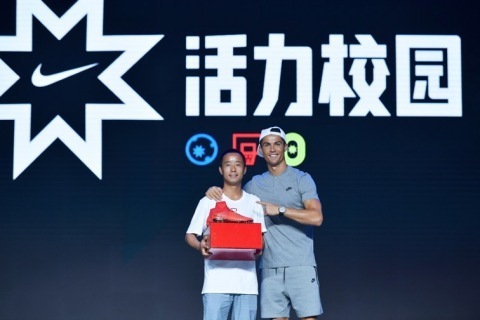 Legendary Chinese athletes Li Na and Liu Xiang attended the event as award presenters, and the award ceremony culminated with the appearance of the world’s top soccer player Cristiano Ronaldo, who came to the Beijing event as part of his “Ignite Brilliance” trip to China. The Active Schools program is part of a long-term strategic partnership between Nike and the Chinese Ministry of Education that aims to encourage children to get active both inside and outside the classroom. As part of this collaboration, the Active Schools Innovation Award is designed to encourage and reward innovative practices for physical education in primary schools, as well as share and promote related experiences, best practices and achievements across regions. The awards also aim to motivate more front-line PE teachers to use innovative ways to encourage children to participate in and become passionate about sports activities. Liu Jianhua, winner of the award for Innovation in Culture of Sport and volunteer teacher in Yire Village of the Erqi Township in Meigu County, Liangshan, Sichuan Province, made the most of existing facilities at his school’s rural location to encourage children to get active. This included regularly showing sports videos to students and organizing a school basketball team and cheerleading squad. Zhang Jing, a PE teacher from the Dongsheng District 4th Primary School of Ordos, Inner Mongolia, innovated from the ordinary by taking advantage of simple equipment to create new group exercises that enabled full, active participation from all of the students. Guo Heng, winner of the award for Innovation in PE Lessons and a teacher from Longxi Special Education School, Gansu Province, originally taught math but volunteered to become a PE teacher at a school for the hearing impaired. After joining the school staff, he began to learn sign language and organized a track and field team for deaf students to give them the opportunity to participate and ultimately develop a love for sports. Lv Shaowu, winner of the award for Innovation in Culture of Sport, is a teacher from Hekou Primary School of the Yongji Township in Longxi County, Dingxi City, Gansu Province. Combining his love for soccer and passion for promoting the healthy growth of children, Lv Shaowu volunteered to work as a PE teacher and designed a comprehensive curriculum for children which covers warm-up exercises, basic skills, team training and soccer knowledge. In the absence of sufficient teaching facilities at his school, Mr. Lv bought sports equipment at his own expense. This not only encouraged the children to get moving, but also ensured that they are able to freely enjoy engaging in sports activities under appropriate guidance at school. 75 pairs of the CR7 Mercurial Campeões boots inscribed with unique numbers were created by Nike for Cristiano Ronaldo to honor his remarkable achievements. Additionally, 49 pairs of these shoes are being auctioned in partnership with Alibaba. Nike will match the proceeds, and the combined funds will be donated to the China Education and Development Foundation, Nike’s Active Schools program and Lv’s HeKou Primary School. “I had never dreamed of standing face-to-face with Cristiano Ronaldo. Soccer is like my second life. Helping more children fall in love with and enjoy soccer is the greatest joy for me. It’s an unforgettable experience for me to be recognized and encouraged by Cristiano Ronaldo. I will continue to work even harder,” said Lv Shaowu. Nike believes in the power of sport to move the world and unleash human potential. However, the world is moving less and less, and today’s generation of children is the least physically active ever. That’s why Nike works to get kids (ages 7-12) active early and for life, because kids are made to play, not to sit still, and active kids are happier, healthier and more successful. Together with its employees, partners, consumers and athletes, Nike also supports important causes which strengthen communities across the globe. Learn more. NIKE, Inc., based near Beaverton, Oregon, is the world’s leading designer, marketer and distributor of authentic athletic footwear, apparel, equipment and accessories for a wide variety of sports and fitness activities. Wholly-owned NIKE, Inc. subsidiary brands include Converse, which designs, markets and distributes athletic lifestyle footwear, apparel and accessories; and Hurley, which designs, markets and distributes surf and youth lifestyle footwear, apparel and accessories. For more information, NIKE, Inc.’s earnings releases and other financial information are available at http://investors.nike.com. Individuals can also visit http://news.nike.com/ and follow @Nike.